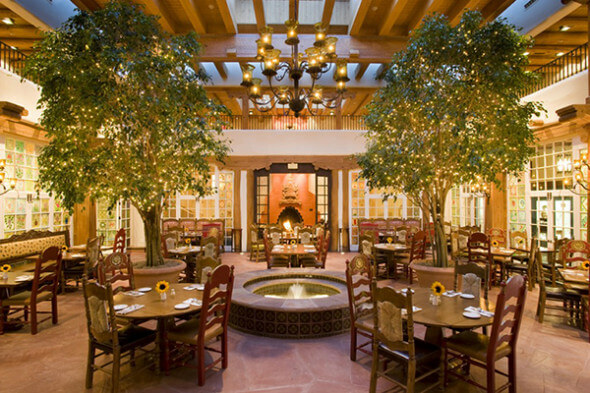 Historically set where the legendary Santa Fe Trail ended, La Fonda (the Spanish word for inn) on the Plaza is considered Santa Fe’s oldest and best known hotel. 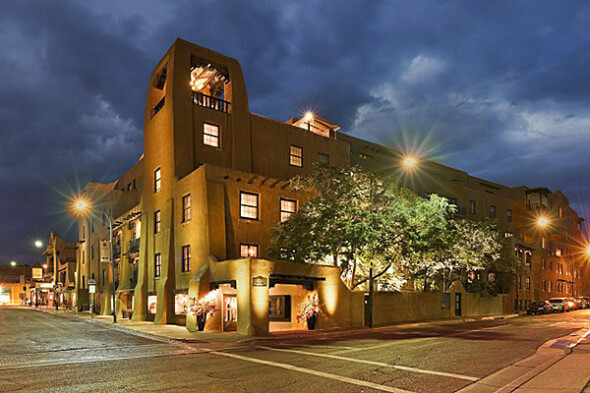 A landmark with its pueblo-style architecture, step inside the hotel and its historic ambiance oozes with the spirit of the Southwest. Hand-carved and hand-painted furniture throughout the large and meandering main floor space is lit by hand-crafted chandeliers—also highlighting colorful painted tiles and other museum-quality local art. The day I arrived to check in, the place was bustling with people (no famous faces that I recognized, however). In La Fiesta bar, folks were sipping margaritas (what else?) while others were eating in La Plazuela restaurant while listening to its bubbling fountain (removed in l976, the fountain was part of the restoration) and admiring the beautiful hand-painted interior windows that enclose it. Many others were simply wandering the hotel’s main floor with its gorgeous artwork– or shopping: There are some 17 stores located within the space as well. La Fonda’s AAA Four Diamond status was apparent the moment the desk clerk warmly welcomed me, asked if I needed help with luggage, and explained parking (the hotel’s parking garage is at the end of the block). The hotel has 179 rooms, including 14 luxury level rooms/suites built around the rooftop terrace. Rates start at $159 and go upwards—to $509 for one of the rooftop suites. 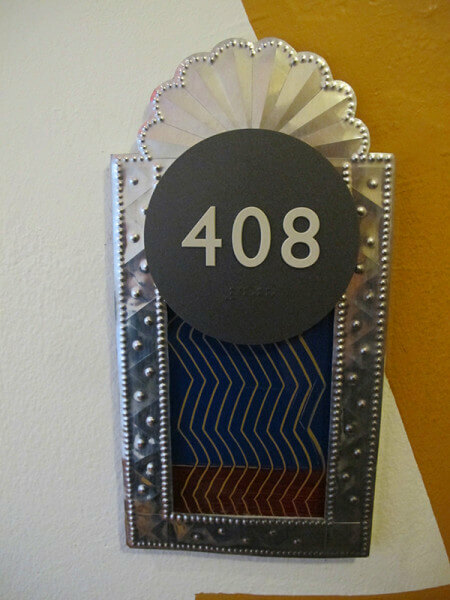 My room, number 408, was a traditional queen that looked out on the pretty Loretto chapel from a small balcony. It was small by the big box hotel standards, but it had everything necessary…and then some. 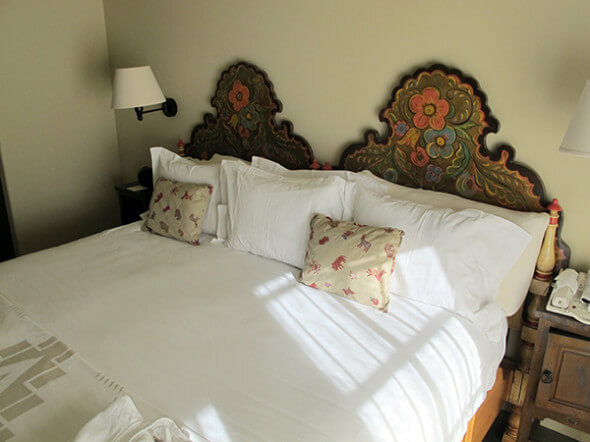 Desk (wi-fi is free), flat screen t.v., coffeemaker, terry cloth robes, Egyptian cotton sheets. But the best parts about the room (and which all the rooms share) are all the artistic, authentic details that make you feel you are really staying in the Southwest. 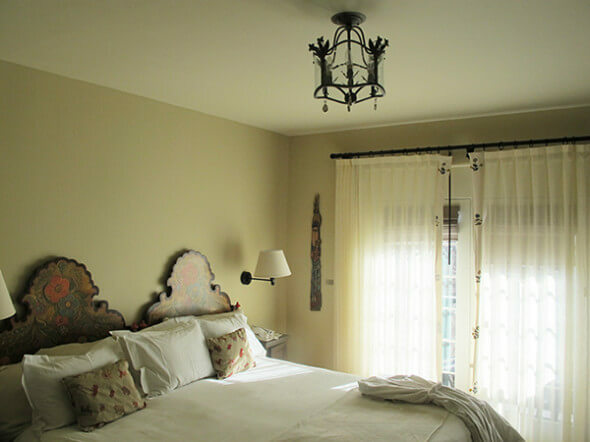 Inspired by the hotel’s original designer Mary Elizabeth Jane Colter who believed in incorporating traditional local art and design into her lodgings, the first things I noticed were the hand-painted headboard and the cool little funky chandelier. Rugs and bed pillows showcased colcha embroidery—an art form in colonial New Mexico. (I only know because I read that in the brochure.) It all looked so stylish and artistically well-done, if I was in the market for re-doing my home bedroom in the Southwest style, I’d want to copy it. There are not many hotels where you can say that about the room’s décor. 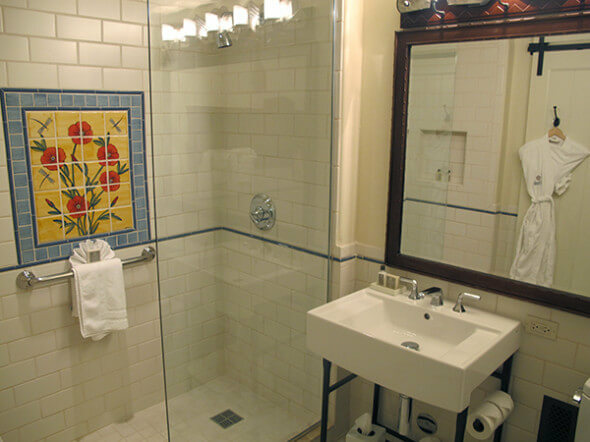 Even in the bathroom, the showers have hand-painted tile murals—all done by local artists. 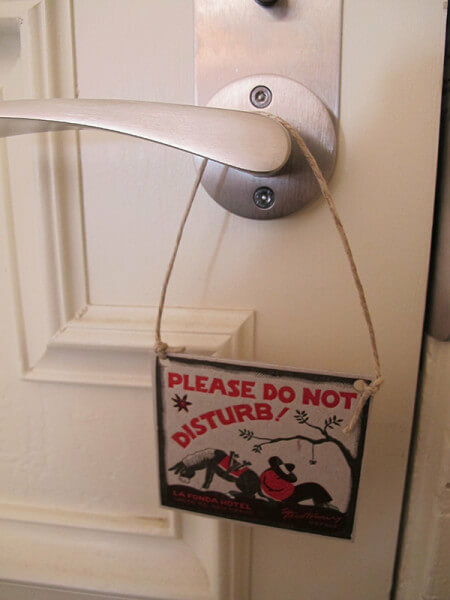 Smaller details featured room numbers displayed on pressed tin while the “do not disturb” door sign was a print of one of La Fonda’s early signature images by Willard Clark and which was a symbol of the hotel for a generation: a burro next to a sleeping figure under a sombrero. I’ve always thought there was a reason why the Santa Fe Trail ended here–and after staying at La Fonda, I now know why. No one wanted to leave the place.